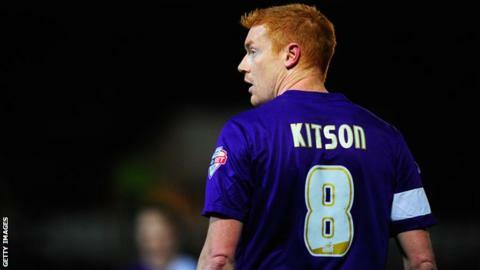 Oxford United striker Dave Kitson has announced his retirement from football. The 34-year-old began his career at Cambridge United and went on to have spells at Reading, Stoke, Portsmouth and Sheffield United. Arguably the most successful period of Kitson's career came at the Madejski Stadium, where he scored 60 goals in 144 appearances and won the Championship title in 2006. That form prompted Premier League Stoke to pay £5.5m for the forward in 2008. But Kitson failed to make an impression at the Britannia, scoring just five goals in 40 appearances and spending time on loan back at the Royals and at Middlesbrough. He went on to join Portsmouth in 2010 and, following a year-long stint with Sheffield United, the Hitchen-born frontman signed for Oxford on a two-year deal last summer and scored four goals in 36 games. "We respect that decision and wish Dave all the best for the future," said Oxford United boss Michael Appleton, who also worked with him at Pompey.